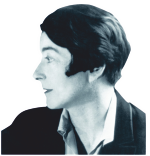 Eileen Gray, a modernist designer, born in, Ireland in 1878. She was an artist, interior designer and architect. Trained in London, but spent most of her time in France. Very few women worked in design during the early twentieth century, as this profession was male dominated. Her work can be regarded as both functional and artistic. Much of her work was at the leading edge of the modernist movement and was influenced in particular, by the Art Deco design movement. In a modernist in style, very different to traditional designs of the same period. It has a simple and functional form and is a timeless design, still popular today and regarded as a classic, iconic design. 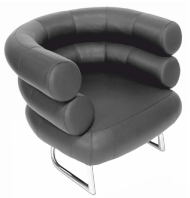 Chromed steel frame and curved leather tubing, giving rise to an extremely comfortable seating position. Designed in 1929 - still manufactured today. 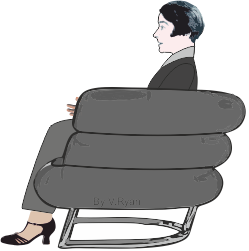 It is another Eileen Gray piece of furniture that has become a design icon/classic. Height adjustable. The stand is composed of two ‘telescopic’ sliding tubes, with a pin on a chain, used to lock them in position. High grade tubular stainless steel and tempered glass, provide a quality finish.